1 How to brew Chinese yellow tea? 2 Brewing Egyptian yellow tea (fenugreek seeds)? Yellow Chinese tea is often confused with the Egyptian yellow tea, and in fact they do not have anything in common! Chinese yellow tea receive special treatment after kidney and young leaves of the tea plant - Camellia. This tea is very valuable, his few varieties, he was served earlier only to the imperial table and was banned for export from China under pain of death. 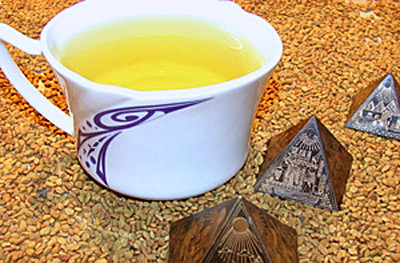 Egyptian yellow tea is obtained from the seeds of fenugreek or camel grass, called helboy. He refers to the legume family, It was known in the times of Hippocrates, used in medicine and cooking of many countries (part of the hops-suneli and curry). The taste of tea rather unusual, but the benefit is undeniable - it is successfully used in prostration, stresses, diabetes, headaches - powerful antispasmodic. Improves metabolic processes in obesity, enhances lactation, colds, women's diseases, for rejuvenating the skin and the body. His healing power due to the presence of vitamins B, RR, BUT, ascorbic acid, amino acids, gland, Selena, zinc, sodium, magnesium, phosphorus, polysaccharides, etc..
How to brew Chinese yellow tea? Take only soft water, bottled or otfiltrovovannuyu. Bring to boiling, but do not boil, We interrupt boiling on the stage of "white-key", in China it is called the "sound of the wind in the pines". Rinse immediately with boiling water prepared custard teapot and fall asleep in it a portion of the yellow tea (about 4 g per cup), fill up ostuzhennym 85aboutWith boiling water, we wait 5 minutes, and poured through a strainer in cup. Brewing Egyptian yellow tea (fenugreek seeds)? For brewing the seeds should be cleaned, then dry a couple of days, poured on the paper and put it in a dry place. Next smalyvaem seeds in a coffee grinder, We fall asleep them in a small saucepan with water (a glass of water to take a teaspoon, It can be more for the strength of infusion). Bring to the boil and cook for low heat 8 minutes. IMPORTANT! Drink only freshly, because nutrients are rapidly destroyed. You can add sugar, ginger, cream, berries, lemon to taste, cinnamon. Warm tea warm, and cold - well quench thirst.